*AdvaCare Atropine Sulfate Injections is GMP certified. **AdvaCare Atropine Sulfate Injections is manufactured in our facilities located in China, India and USA. AdvaCare is a GMP manufacturer of Atropine Sulfate injections. Atropine sulfate injection is a sterile, nonpyrogenic isotonic solution of atropine sulfate monohydrate in water for injection with sodium chloride sufficient to render the solution isotonic. It is used as a parasympatholytic in horses and cattle. It is also used as a partial antidote to organophosphorus poisoning. It is also used for the reduction of salivary and bronchial secretions, prevention of cholinergic effects on the heart. As with all veterinary medicine, some unwanted effects can occur from the use of atropine sulfate injections. Always consult a veterinary physician or animal care specialist for medical advice before use. No side effects have been detected yet, a transient local reaction may occur at the site of injection. 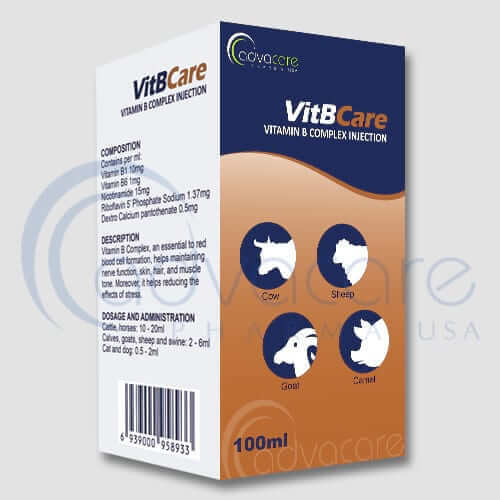 If you notice any serious effects or other effects not mentioned on this package, please inform your veterinary surgeon. For a comprehensive list of all possible effects, consult a veterinary physician. If any symptom persists or gets worse, or you notice any other symptom, then please seek veterinary medical treatment immediately. Always consult a veterinary physician or animal care specialist before using atropine sulfate injections. 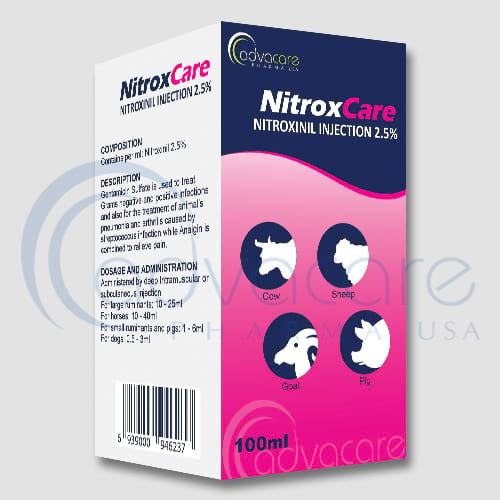 For use as an antidote in the treatment of organophosphate insecticide poisoning of cattle, horses and sheep. 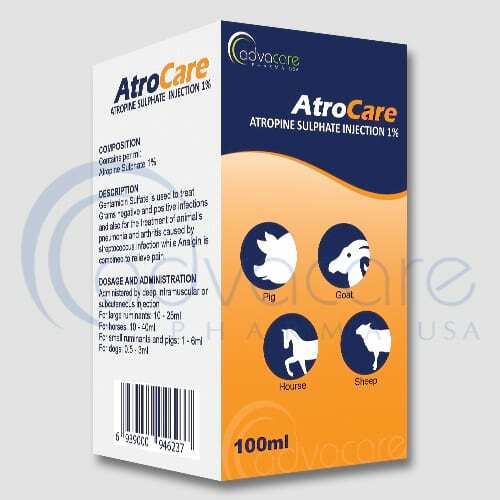 Atropine injection is given in emergency situations and works like a bronchodilator with horses facing breathlessness or chronic obstructive pulmonary disease. Atropine is used in the treatment of unusual heart rhythms, especially those that occur during anesthesia or in response to other drugs. Atropine is also used to dilate the pupil of the horse’s eye during diagnosis and this is also a part of treatment in pain management from the recurrent uveitis and other diseases of the eye where dilating the pupil helps in non-formation of scars that might permanently interfere with normal pupil function. A thorough examination of atropine sensitivity should be performed before dose administration. Administration of atropine in goats and pigs is not advisable. 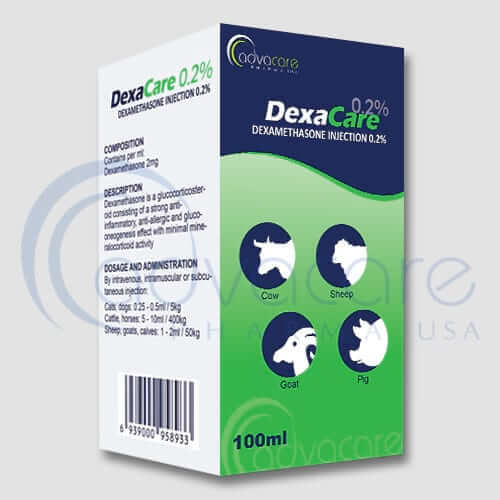 Usual dosage is as follows: 20 mg of atropine per 45 kg body weight in cattle, 6.5mg of atropine per 45 kg weight in horses and 20mg of atropine per 45kg body weight in sheep (intravenously). Atropine sulfate injections shouldn’t be administered if any hypersensitivity is discovered. The average recommended initial dose should be given as 1/4 the total dosage and followed by 1/3 of remaining dosage. It should be slowly administered intravenously, and the remaining dosage should be administered intramuscularly or subcutaneously. Maintenance doses should be administered based upon the individual health status of the animal under the control status of the animal. Completion of full treatment is always advisable with or without the presence of symptoms. Sometimes, horses develop colic which is caused by the slow action of gastrointestinal tract. Extreme caution should be taken with use in horses with kidney or liver disease due to increased severity of side effects. Extreme caution should be taken when administering the dosage in foals. This alkaloid injection is an FDA-approved medication for extensive use in horses under the supervision of a veterinary physician. Atropine is prohibited in most sanctioned races. Checking with the concerned regulatory group and lawmakers is recommended. A naturally occurring alkaloid which is poisonous for human consumption. Keep out of reach of children. The severity of side effects is increased with the administration of overdose; therefore, it may also cause restlessness, muscular numbness, convulsions, and respiratory malfunction and ultimately death. Interaction of atropine with antihistamines, phenothiazine tranquilizers, and some painkillers has been reported. Increase in the probability of side effects has been stated during the continuing use of corticosteroids in the treatment of chronic obstructive pulmonary disease in horses.